It’s a big week in Edmonton transportation, with a fairly major decision coming on the Valley Line West. 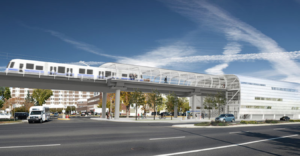 This LRT extension has been in the works for years, and is nearing what could be its final votes before a potential construction start in 2019. Probably. There have been a few wrenches throws at the plans in the last few months, including noise from city council candidates (and some local media) about whether a bus rapid transit system would be cheaper more effective for the route from downtown out beyond West Edmonton Mall. It turns out the answer remains the same as when council decided nearly a decade ago to go with LRT: trains will move more people and won’t be more expensive over a generation of use. BRT could also clog up the streets even more because many more buses with dedicated right-of-way would be needed to move as many people as a low-floor train gliding down the middle of the road like a streetcar. The other factor playing into the vote this week on the new (and final?) 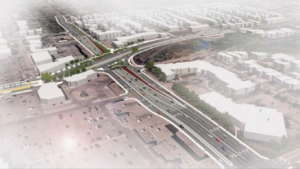 concept plan is the potential to add a pair of raised crossings. One would be at West Edmonton Mall, heading west from the station over 178 Street, and the other is an underpass/overpass/freeway kind of thing at 149 Street. Nobody appears to like that design, and it would likely knock down efforts to create a community hub around the LRT. Both of those items also raise the total cost of the extension to more than $2B, which means that new price tag causing anxiety around the city council table. This all makes for an important decision. Does this new city council continue the needed work of building out our mass transit system, or do they get nervous about costs and adding a few seconds to the commute of someone driving? If Edmonton is to be a forward-thinking city that wants to build for its future residents, we need to move ahead with the Valley Line West this week. The Valley Line Southeast is going to see the new footbridge over the North Saskatchewan delayed because of a mysterious slab of concrete underneath the river bed. This is a major delay on the project, and lots of people were already upset about losing the Cloverdale Footbridge. Bouncing back to the Valley Line West, how are we going to make sure people can walk through the neighbourhood? It should be easy, since many cities have streetcars and low-floor lines in vibrant communities, but it’s very much worth asking the question before final plans are in place. Also, Troy Pavlek dug into photo radar numbers for last year and has a pretty good look at how the program is operating, how many people get multiple tickets and whether it seems to be doing what it’s supposed to (slowing people down). He’s also had some things to say about local media coverage of his work on this issue, which is notoriously bad for “bothsideism” that negates facts. It’s been a little while since I’ve written a Headlines post, and I want to call attention to some important and interesting stories related to Edmonton women, and a number of social issues they’re fighting for. Just over a week ago, #metoo move beyond the hashtag locally, with some focus on sexual harassment at the Africa Centre. The creator of the #metoo movement will be here in May. More women being heard when they publicly call out sexual harassment and assault has increased pressure (and wait times) on our many services and resources, which are getting a needed boost of funding. If you’ve been following the stories coming out of Edmonton’s maximum security prison, this lawsuit filed by four female employees is not surprising, although the details are still appalling. Pregnant women without a place to go now have a new home in Edmonton, thanks to a building donation. The Needle is closed for good. As the former venue’s landlord points out, it’s going to be important for people in such positions to start considering the policies (and behaviours) of their tenants. CBC has a story about ongoing sexual harassment at an Edmonton Canada Post mail plant. And the Citadel Theatre is apologizing for past harassment and abuse. It’s not citing specific incidents but is acknowledging it hasn’t always been a safe space for artists, performers, staff of productions and others on and behind the stage. If you are someone who was hurt at the Citadel, the theatre is also offering time and space to go back as part of your healing. There have also been a number of stories I want to point you at related to Indigenous issues in Edmonton and Treaty 6. As the Alberta government works on preparing an apology to people taken from their families in the Sixties Scoop, our city hosted one of the hearings where people could share their stories and what they may be looking for in a healing process. A court case we’ve mentioned before has been decided, with the judge ruling a man’s Charter rights were violated by a police stop but that he wasn’t targeted through racial profiling. (We’ve got a feature story on racial profiling through “random” street checks.) City Centre Mall is again in the news for its treatment of an Indigenous elder. Alberta Native News has the story, and it appears the cultural sensitivity training the mall did after the last incident of discrimination needs to be done again. The Edmonton Fringe is embracing a role in reconciliation, and is among other organizations recognizing this role. The Fringe is working with Naheyawin, whose good work we’ve talked about before. And Alberta has its first woman to be elected regional chief of the Assembly of First Nations (AFN). Also, I’m interested to see what the community kitchen coming to the new Stanley A. Milner Library downtown is going to be all about. Teaching people about food, and cooking, is such an important task for the library to play a part in.